Minimalist kids are kids who are content. Kids who know how to play, kids who know how to talk and have relationships. They’re not glued to screens all day. They spend a lot of time playing outside using their imaginations, conversing with their friends or siblings if they have them. And honestly, they enjoy more of a 1970’s sort of childhood than a 2018 one. If we are going to choose to live a minimalist lifestyle, then we are raising our kids to do the same. That means we are shaping the next generation and how amazing is it that we have a chance to break the over-consumeristic cycle? I love that I get to do that for my kids and hope that you find encouragement to do the same from this episode! Why your kids will naturally adapt to what becomes normal and how you can create a new normal of minimalism for them. 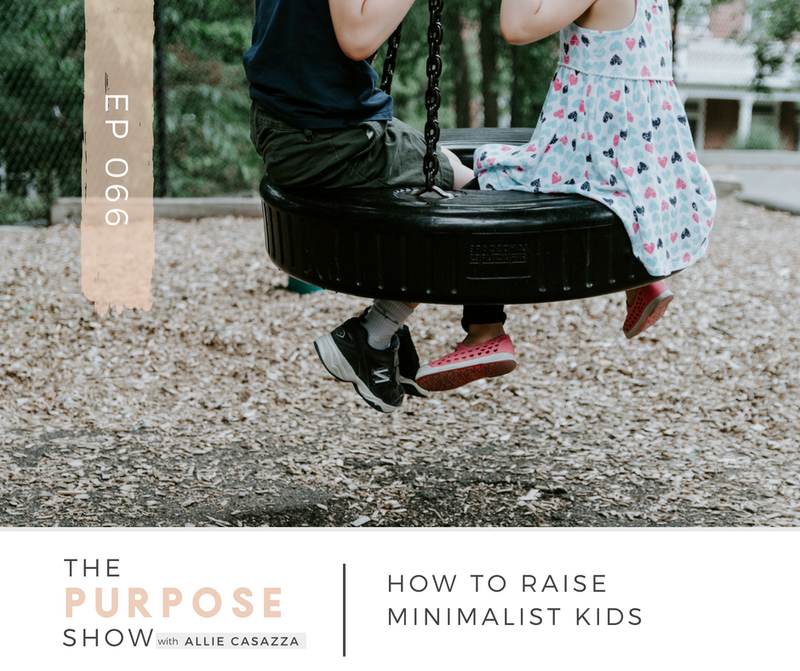 How to avoid becoming super legalistic about minimalism, especially when it comes to your kids. The positive impact and benefits that boredom can have on your kids. The value of investing in things that bring your kids together and how it benefits them and your family. Can I Let My Child Be Bored? Hey, beautiful friends! Welcome to another episode of The Purpose Show! Whether you’re brand new here or you're an old buddy of mine who's been listening since day one, I want you to know that I don't think you're here on accident. I really do believe you're here for a reason and I'm so glad that you are! Welcome to my show! Anyway, how to raise minimalist kids. There's a lot that goes into this, so I'll probably end up doing like a Part 2 and maybe even 3 to this episode at some point just because it's a lot. I have a feeling that this topic is something that you're going to see on a somewhat regular basis on the show. Like I said, there's just a lot that goes into it. I'm kind of always learning and things change and shift and different topics and questions come up. So, let’s just start here. I'm going to get into a few of the biggest things that go into raising minimalist kids. What I mean by minimalist kids is kids who are content. Kids who know how to play, kids who know how to talk and have relationships. They're not glued to screens all day. They spend a lot of time playing outside using their imaginations, conversing with their friends or siblings if they have them. They enjoy more of a 1970’s sort of childhood than a 2018 one. So okay, let's get into raising minimalist kids. The first thing I want you to know about doing this is that your kids are going to adapt to what becomes your normal. So, I know when you have your normal, your family is the way they are, your home is the way it is, you guys kind of live the way that you're living and you're focused on the things are normally focused on, it can feel really daunting to change that and your kids can push back. It’s human nature to push against any change, even if it's positive change. Human beings just resist change in general by nature. It's so true. But if we're just patient and calm and consistent with these positive changes we're bringing into our family, they're are going to adapt and that's going to become normal one day. You got to your current normal, you know at some point. So, we're going to just switch up and people will adapt. If you make changes and you stick with it and like I said, you're consistent, your kids are going to see that this is the way things are day in and day out, and over time it's going to become their normal too. So, don't stress out if it feels like there isn't too much for kids to do or if during the initial lifestyle shift they're kind of whiny and they just kind of seem to not know what to do with themselves. That's totally normal and it will go away, I promise. But you've got to stay consistent and you've gotta make this a positive thing. Don't make it feel like a punishment. You should just gradually shift into the minimalist lifestyle. Start to limit things. Things that you buy. Talk with your kids. Why aren't you buying that toy? Why aren't you going to go and get this expensive thing? Why aren't you spending money the same way you were before? Why are you purging your home of clutter? Let them be a part of the process. This is why I always, always, always preach to you guys to make your kids a part of the process when you are decluttering their toys. If they're super small, it might not be doable and it probably wouldn't even do anything. But other than that, once they hit age 3, make them a part of it. Even if you don't think they understand, explain to them what you're doing and why. Let them see the good they're doing by donating things they're not using anymore to kids who are more in need than they are. Make them a part of the process. Make them a part of your process. Tell them you want they’re help as mommy clears out her wardrobe. Make them a part of the process. Make this your new normal. Talk to them. Be normal about it, and it is going to be their normal too. The next thing I want to say is stop making things the center of your kids' world. So, kids naturally gravitate to toys and new things just like any other human. Think about it. We do this too. It's not just with toys. They are kids; we are adults and it's the same thing. We do it all the time. You might maybe be out and see a black blouse and you’re just so drawn to this blouse. It's beautiful. You have to have it. You buy it and you get it home and you realize I actually already have this blouse. It's just from a different store. But that one was amazing to you and you kind of forgot about the other one because it's new. So as human beings we just naturally gravitate towards shiny new things and we're greedy. We want things. There's nothing wrong with that and you shouldn't make your kids feel like there's anything wrong with that, but it's just kind of raising them up in a way that just shows them there's a better way than this. So just realize it's okay that your kids are naturally gravitating to toys and new things. That will change as they grow and mature and as you make this the normal like we talked about. And just so you guys know, my kids, they are drawn to things just like we are. I mean it's just not the norm to get them. It's not normal to, “Sure! You can buy that. Sure, we’ll order this on Amazon.” It's just not normal. We question things. And my kids will say things like, “Man, I really love that black horse that I saw at Target but I just really don't need that toy because I already have a black horse and I already have a lot of other horses.” They're learning to appreciate that something is cool and not necessarily need to have it or make a goal to get it. And speaking of Amazon, my kids, one of the things that they love to do more than anything is to go on my phone and look on the Amazon App for the next Minecraft toy or whatever they're into currently that they're gonna save their money for and buy with the money they earn. I don't discourage them from thinking about things. To me, and this might be an offensive example, but I'm going to go here anyway. To me, that's kind of the equivalent of being legalistic about your faith and kind of forcing rules down your kids’ throat. What happens when parents do that. Remember when we did the interview with the author of Why I Didn’t Rebel? They go the other way. They rebel. They push against it eventually because it's legalistic and it's just a bunch of rules that they don't understand. And so, if we do that with minimalism and kind of take on that legalistic approach of, “Oh, we're not going to look on Amazon for toys. No way! We're not even going to talk about toys. You don't need anything. You shouldn't be focused on things,” it just kind of pushes them away. It doesn't make any sense. We’re human beings. Everybody likes new things. It's okay. It's just a matter of asking why. Why is this worth my space? Why am I going to pursue this thing? Showing your kids that and not expecting them to get it down perfectly when they're little kids. It's just that you're raising them in this lifestyle and teaching them like you do other things to question what takes up their space. The point is that things are not the heart of our physical space. Your home is minimal. You're showing them that that's not what you use your space for, and you're showing them that experiences are better than things by setting that example. But also not discouraging them from being normal people and wanting to think about things. The next thing I want to say about raising minimalist kids is that you don't have to go way against the grain with this if you don't want to. To the point where you're weird and you never allow things to take up space at all and your kids are getting the vibe that “toys are forbidden.” You'll just get the opposite of what you're going for, like we just talked about. In my opinion, just relax. Live a minimal life yourself. Listen to your kids when they talk about toys they saw or want. You're there for them. Encourage them to earn and save their own money and understand the value of a dollar. You get them toys they truly want for birthdays and holidays and you just live your life. You don't obsess over forcing them to become minimalist adults who don't ever think about toys or things. You know, they’re kids. You're still the parent. You're still setting that tone and putting boundaries in your home, just not in a pushy way. Also invest in things that bring them outside and together. This is kind of like the rule of thumb for us. We do spend money on our kids and for our kids to have things to play with, but it's things that bring them, like I said, outside or together. This includes technology and toys. The Nintendo Switch is something that brings them all together. Brian and I went back and forth for a year about whether or not to get the kids the Nintendo Switch system. We had the old school Super Nintendo, and we really liked that, but it was starting to break and just get kind of glitchy and weird. We found that you could get all the old games on The Switch, and the new games, and my kids just really liked playing video games together. They rarely argue and bicker when they're playing video games. It's just something that brings them together. And Brian and I actually liked to play with them too on game night. So that was a positive thing. We were just worried that it would be a burden to limit the time they spend on there, but we decided, you know what? No, we're the parents. We can enforce these time boundaries as it kind of feels good to us. The Switch is something that brings them all together, so we're going to get it for them. My kids' birthdays are all pretty close together and so we got it as a family gift for one of the birthdays and it's been great. Totally brings them together. They play with it together. They love playing together. Actually, I don't think they ever play like one person at a time. They only play games you can play together or they take turns really well. It's just the way that they are. If they ever do bicker, we turn it off and it's put away for a day or two, maybe even longer. They know that and I think that helps. And of course, this includes some toys. Toys that bring your kids outside – great! That's a good investment. Get them outside more. And I also think that realizing that boredom is actually really good for your kids is huge. A lot of moms message me things like “I'm trying to just limit toys and we've gotten rid of so much and my kids are getting on board. This whole week is our first week and they've just been like, I'm bored. I'm bored.” That's good. I would encourage you, I will link to a few articles in the show notes for this episode, but I would encourage you to do your own research as well on the effects of boredom on kids and how good boredom is for kids. Science shows us that this is where kids develop imaginations and grow their imaginations and creativity. Let their minds wander and they realize things about themselves. They find themselves. They develop who they are. So just realize that boredom is not a bad thing. It's actually really good for your kids. They’re going to learn more about themselves. They're going to develop more. They're going to know how to play. They're going to learn to entertain themselves, make up games and make up things to play. It'll force them outside to make new friends. It's really, really good. 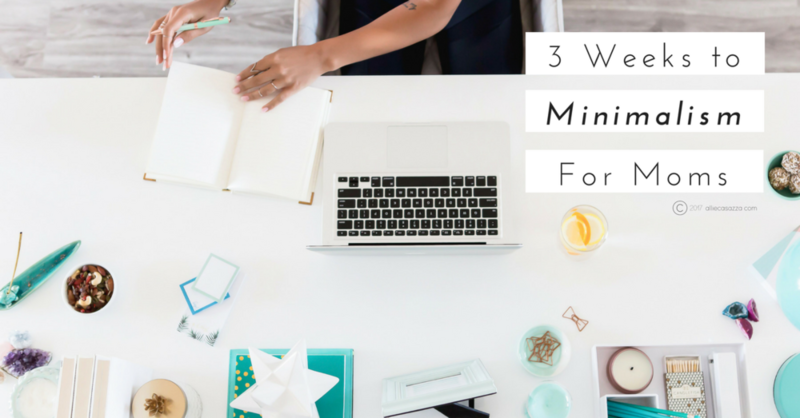 So, I would say these are the top few main key points about raising minimalist kids. I really hope that this encourages you to make some positive changes in your family and answers a few of the questions. I know there's so much more we could get into and we'll have to do in later episodes, but these are sort of the keys that Brian and I have implemented in our home. Realizing that what's normal to us will become our kids’ normal too. We don't make things the center of their world. Realizing that we don't have to go way against the grain and be super weird and legalistic about it. We can invest in toys, technology and things that get our kids playing outside more, get them playing together more. But also not too much because it's good for kids to have very little and to create their own entertainment. And boredom is good for your kids. So, I hope that is a great starting point for those of you who are interested in creating a life of less for your family.